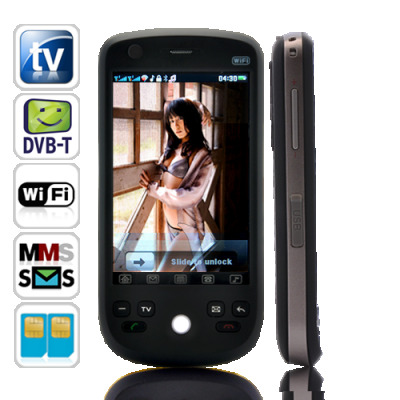 Successfully Added MediaCom - 3.2 Inch Touch Screen Cellphone with WiFi and DVB-T to your Shopping Cart. Tons of amazing functions at a low wholesale price, get the most out of your phone with the new MediaCom 3.2 Inch Touch Screen Cellphone. With WiFi, DVB-T digital TV, and many more cool extras, the MediaCom guarantees you'll always have something to do. The MediaCom cellphone provides top of the line features such as dual SIM card slots for using two active phone numbers in one phone and Quadband GSM connectivity for using this phone anywhere in the world. It also includes a well-built, solidly put together frame with a 3.2 inch touchscreen, which makes navigation smooth and convenient. Get your daily dose of mobile digital TV with the MediaCom Cellphone. Available at any time and any place, the MediaCom offers high quality DVB-T digital TV, which means you can enjoy live sports, news, weather, and your favorite shows all from the palm of your hand. You're always a few clicks away from free Internet with the MediaCom's WiFi capabilities. Check email, log on to Facebook, or browse the web - all from your phone! The MediaCom also offers Bluetooth, Java, MP3/MP4 players, picture/video/sound recorder, and an endless list of other useful features, so you get it all. There's Chinavasion. The leader in factory-direct electronics brings you everything at affordable wholesale prices, so you can buy one for yourself, give one to a friend, then sell a few online to bring that money back. Stay connected with Facebook and MSN! This looks like the Eclipse, is it the same? No, this phone simply uses a very similar outer case due to demand caused by the popularity of the Eclipse. The operating system is different and the MediaCom comes with DVB-T digital television. This is a nicely built phone and the wifi works in the U.S. It is thinner than the pictures suggest. I liked the fact that the shipping was super fast and that someone took the time to make a second box around the orginal one to protect it. I was looking for a good buy on a phone with dual sims and wifi and I think I found it. Works with my AT&T sim card. Thank you for the good service. Using it over a week, and I very like it. The installed Opera Mini cannot browse in china, but in menu option can choose Chinese version which one can work. Stylus lost on 2nd day, replacement arrived in 4 days. So far so good especially for the money paid for.